Munk Studio functions within the structures of Polish Filmmakers Association and was set up to focus exclusively on producing directorial debut films. The goal of the studio is to discover and support talented young directors in making creative, art-house cinema. Their short films are present at various international festivals and two of them were nominated to European Film Award: “Glass Trap” the short documentary directed by Paweł Ferdek (2009) and “Hanoi-Warsaw” the short feature directed by Katarzyna Klimkiewicz, which won the EFA this year. 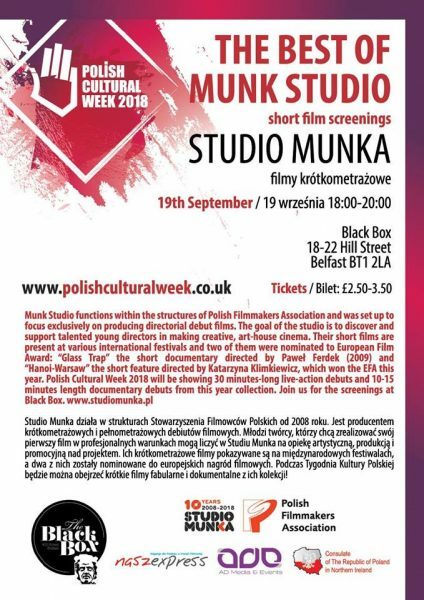 Polish Cultural Week 2018 will be showing 30 minutes-long live-action debuts and 10-15 minutes length documentary debuts from this year collection. Join us for the screenings at Black Box.